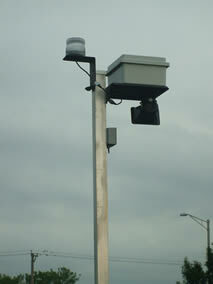 A Lightning Detection System provides early-warning of lightning throughout our parks, pools, golf course and stables. The Strike Guard Early Warning System detects and tracks lightning strikes and provides warning when lightning strikes cloud to ground within a 5 mile radius. When lightning strikes have been detected (no false alarms) within the warning area, the park systems in that zone will provide warning. One long (15-second) siren will sound, and a strobe will flash on the unit. 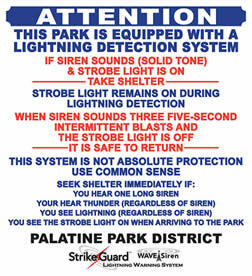 After the Strike Guard System determines conditions are safe, (30 minutes of no lightning) the siren will sound three five-second intermittent blasts and the strobe will go off, providing notice that it is safe to resume activity in this area. Warning sirens and/or strobes are divided into two zones, one for active parks, and another for passive parks. Active parks will provide lightning warning from 7:00 a.m. to 11:00 p.m., and passive parks from 7:00 a.m. to 8:45 p.m.
Birchwood Park, Celtic Park, Community Park, Eagle Park, Tom T. Hamilton Reservoir, and Ost Field. Birchwood South, Cardinal Park, Falcon Park, Finch Park, Juniper Park, Doug Lindberg Park, Maple Park, Oak Park, Osage Park, Palatine Hills, Palatine Stables, Plum Grove Reservoir, Sycamore Park, The Grove, Towne Square, and Willowwood Park. Familiarize yourself with the warning unit in a park near you. Each location will have signs such as the following explaining the Lightning Procedures. You can hear the sirens by going to the link of the Palatine Park District web site and listening to the take cover and all clear siren tones. Sirens and strobes will not go off when the parks are closed for the evenings or during none usage winter months. You hear one long siren. You hear thunder (regardless of siren). You see lightning (regardless of siren). You see the strobe light on when arriving at the park. No place outdoors is safe when a thunderstorm is near. The best shelter from lightning is to be inside a substantial building. Avoid car ports, porches, garages, sheds, tents, baseball dugouts, or under bleachers. If no substantial shelter is available, then seek refuge in a hard topped vehicle, with the windows up. Stay away from trees, electrical poles, or other tall objects. Never lie flat on the ground. Crouch down on the balls of your feet to create the lowest profile. Strike Guard status is updated every 1 – 4 minutes. Refresh page for current conditions or press F5. Contact our Parks & Planning Department at 847.705.5140 with any questions. If you have questions about a District project, you will be transferred to the project manager. Interested in Upcoming Projects? View current Bids & Proposals.